Playgrounds help children get outside to enjoy the fresh air and the sun. Playing outside is a great way to get children to exercise and to socialize, but there’s a pretty big danger for anyone who looks up: the sun. Being outside in the sun can help children get vitamin D, which is beneficial to their health. Unfortunately, sun damage and sun burns can easily occur. When children play on the playground, especially, they can easily lose track of the time and get a significant sunburn. Protecting children from sunburns. A sunburn is actually a natural defense mechanism created by the body to protect us from dangerous ultraviolet sun rays. The defense mechanism the body uses to defend against these rays is a pigment called melanin. When the defense process is overwhelmed, a sunburn results from a toxic reaction. Sunburns can be painful and can increase the likelihood of cancer later on in life. A severe sunburn can even cause blisters, peeling and flu-like symptoms. Protecting children from surface burns. Playground equipment, especially in darker colors, can become heated from the sun and high outdoor temperatures and potentially cause severe injuries to children, including 2nd degree burns. In addition to paying attention to the potential for sunburn, parents, teachers, and other guardians need to be aware of the surface temperature of playground equipment. IPEMA, the International Play Equipment Manufacturers Associations, states that plastic slides insulate better and do not conduct as much heat as bare metal slides; however, even plastic slides can become too warm in direct sunlight or extreme temperatures. According to the CPSC, plastic can become too warm for comfort or safety with outdoor temperatures as low as 74 degrees Fahrenheit. Protecting children from heat exhaustion and other heat-related dangers. Heat-related illness occurs when the body becomes dehydrated or over-heated. Heat-related conditions such as heat exhaustion can result in dizziness, nausea, poor coordination and other serious symptoms. In some cases, if left untreated, heat-related dangers can become life-threatening. In most cases, these conditions occur because the body’s natural way of dealing with heat (sweating) is not enough. As a result, heat rash, heat exhaustion, heatstroke or heat cramps can occur.Staying hydrated and taking in enough electrolytes can help. Electrolytes are tiny particles which conduct an electric current to facilitate proper functioning of muscles, fluid balance and other vital systems. Proper hydration with water can replenish moisture depleted in heat through sweating. Snacks rich in calcium, potassium, sodium and chloride can help maintain electrolyte balance, which can also be affected by sweating. Orange juice and healthy snacks in combination with water can address these needs. Shade is also important, since it can prevent excessive heat. For children, shaded playgrounds are an important option, since children like running around in the heat and may not know they need to take things easier to avoid heat-related illness. Eye protection. The eyes are vulnerable to the rays of the sun. Glare from playground equipment and a lack of shade can result in damage to the eyes, including permanent damage. The lens and cornea can be especially vulnerable. Since there are so many ways children can be affected by the sun when they play outside, it’s important to do more than just apply sunscreen. Considering all the dangers caused by the sun and creating playgrounds which help protect children from heat and UV rays is a smart move in helping children enjoy the outdoors without the risks associated with sun exposure. Why Is Playground Sun Safety Important for Kids? The CDC notes unprotected skin can burn in as little as 15 minutes, and sun damage can increase the risk of skin cancer later in life. In fact, it only takes one or two severe sunburns in childhood to double the risk of skin cancer later in life, and most of the skin cancer risk adults face stems back to sun exposure from childhood. Since most children play on a playground for more than 15 minutes at a time, it’s important to think of sun safety. The sun can cause painful blisters and burns. It can cause peeling, and for young children with severe burns, it can even cause flu-like symptoms. The sun can cause heat exhaustion and overheating. Excessive sweating can cause heat rash. When the body can no longer sweat enough to cool itself down, children may be vulnerable to heatstroke and other serious conditions. Sun exposure can cause eye damage. Sunlight can heat up surfaces, causing discomfort and even burns. Children may not realize they need to get out of the sun and may not recognize the early signs of sun damage. It’s up to adults to ensure children are well-protected. 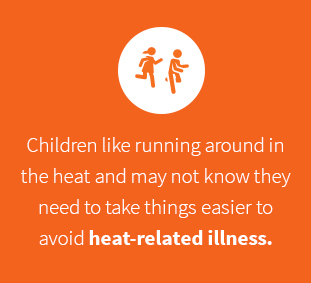 Children are active, even in hot weather, putting them at greater risk of sun exposure and heat-related illness. A little sun protection now can help children avoid serious consequences, painful burns and even potentially fatal conditions later in life. Sun safety is an important part of overall playground safety for kids. You can’t have a fully safe playground unless it’s also reducing the risk of sun damage for children. Sun protection is also crucial in building an inclusive playground. Some children have sun sensitivities. For example, children living with photosensitivity, polymorphous light eruption, lupus, actinic prurigo and other conditions may not be able to tolerate sun for long and may suffer from rashes and significant skin irritation or symptoms if exposed to even small or moderate amounts of sun. Polymorphous light eruption (PMLE). People suffering from this condition may develop a skin rash with even mild exposure to the sun. Sufferers may have mild or serve symptoms, ranging from a burning rash to chills, headache, nausea and even bleeding under the skin. Actinic prurigo. Also known as hereditary PMLE, this condition leaves sufferers with a rash around the face and mouth. Symptoms may be more serious than with PMLE, although many sufferers have similar symptoms as people with PMLE. Solar urticarial. This condition causes hives, even with relatively small exposure to the sun. Photoallergic eruption. This condition causes patients to experience an allergic reaction to the sun after they have taken a medication or have applied a topical product. Some antibiotics, for example, can make children and adults more vulnerable to the sun. By offering shade and a sun-safe playground, you can ensure children who both have and do not have these conditions can enjoy play time. A sun-safe playground can also be accessible to adult caregivers who are living with sun allergies and those who do not have any such conditions. The sun has two types of rays, and it’s important to protect children from both. UVA rays are long wave ultraviolet A rays, and they can penetrate deep into the skin, where they can affect cells and may cause cancer, according to the Skin Cancer Foundation. UVB rays are short wave ultraviolet B rays, and they affect the top layer of skin, where they can cause painful burns, blisters and other damage. UVB rays are also strongly associated with cancer risk. Children spend peak hours (11 a.m. and 4 p.m.) on playgrounds, especially on weekends and in the summer, when UV rays are highest, increasing the risk of burns. Children are simply more likely to be on the playground during higher-risk times, so protecting your children on the playground means safer sun exposure all around. SPF and hats are helpful for protecting against sunburns. However, heat-related illness as well as playground equipment that is hot to the touch could still be issues. Both of these can be reduced with shade, which helps keep play areas slightly cooler. In addition, hats and SPF rely on parents and children being vigilant. Hats can become lost in play, and sunscreen wears off, meaning reapplication and supervision is needed. Shade provides an ongoing form of protection. Children and caregivers may assume that darker days mean no risk, but this is not the case. Clouds only filter UV rays, meaning they actually offer very little protection from these harmful rays. It’s still possible to get a sunburn on a cloudy day, and because many people are unaware of it, they may not apply sunscreen or wear hats. In this situation, quality shade at the playground can help avoid burns. 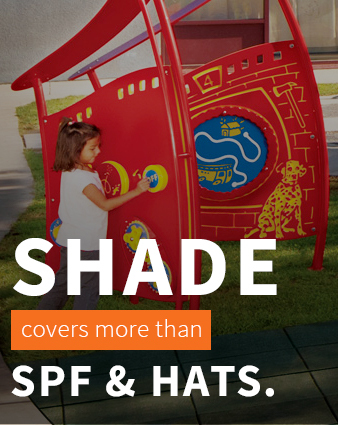 Playground shade structures provide an added barrier when used with SPF and hats. Shade covers more than SPF and hats alone. It keeps children’s entire bodies safer from the sun. Shade lets children play longer, allowing them to enjoy the outdoors and stay active. We’re all aware of the importance of physical activity and exercise for children. Fresh air, social activity and staying active help children stay socially, mentally and physically healthier. Shade allows children to enjoy the outdoors and play time for longer periods, allowing them to reap all the benefits of playgrounds while also reducing some of the dangers. Shade lets children still get some vitamin D and some time spent in the shade can improve vitamin D absorption. Vitamin D is especially important for immunity and for growing bones, meaning it’s especially important in childhood, when both bones and immunity are developing. Shade protects playground equipment from overheating, which can help extend longevity in some cases. Shaded playground equipment become less hot to the touch, reducing the risk of contact burns. In addition, shade keeps playground colors from fading and can help keep plastic and other materials from warping, allowing playground equipment to stay looking newer and more attractive for longer. Shade over benches or seating for caretakers lets parents remain on the playground in comfort and supervise more closely. Children are not the only ones who need shade on the playground. Caregivers are more likely to supervise and to stay alert when supervising children if they have a shady area where they can sit and watch playtime. Shade can reduce glare, helping parents keep a closer eye on children and reducing eye risk for children. For children, glare can lead to headaches, pain behind the eyes and even eye damage. For parents, glare can hamper clear visibility of their children. Shade can help reduce glare, meaning parents can keep a closer eye on children and children can enjoy the outdoors without pain or eye injury. Shade can offer sun protection and cooler temperatures. The CDC and other agencies suggest hats and long sleeves to protect children against sun exposure. However, in hot weather, hats and long sleeves can contribute to overheating and can be uncomfortable. Shade can keep things cooler and safer for children, meaning children can wear more comfortable clothing on the playground. Even when we’re vigilant about sunscreen, sunglasses and hats, sun risks exist. Shade on the playground can help children reduce some of the risks of playing outdoors. Trees. Fast-growing trees can help provide shade within a few years. The main problem with trees is that they must be carefully maintained and trimmed back so they don’t pose a hazard. It’s also important to consider root systems when planting trees. Root systems can expand far underneath playground equipment, potentially causing damage and structural integrity issues underneath the playground itself. If roots appear aboveground, they can also pose a tripping hazard.Even with faster-growing trees, it can also take years to grow a tree to provide enough shade. In many cases, it’s simpler to use an existing tree and build a playground around it rather than trying to grow trees for shade. Vines and shrubs. 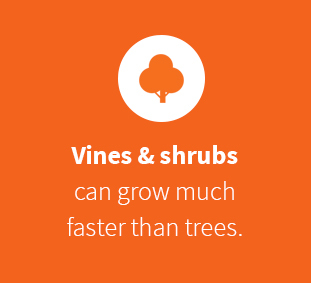 Vines and shrubs can grow much faster than trees, meaning they can be grown over trellises or structures to provide shade. Like trees, they need to be trimmed back and maintained. Root systems are not as much of a problem, but it can still take years to develop a thick enough foliage cover to offer true shade. Even then, as with trees, shifting leaves can mean sun protection varies widely. UV rays can still get through. Portable shade. Canopies can provide portable shade and a flexible option. They allow different parts of the playground to be covered at different times, which can be convenient. However, portable structures need to be taken down and set up again, which can be time-consuming and impractical. Custom-designed structures. These come in the shape of flowers or special shapes, which can add some fun and color to the playground while also keeping children safer from the sun. Custom shades can also call attention to specific areas of the playground. Canti shades. With few columns, cantilever shades can be a good option if you don’t have much room for a post or your playground has a surface which will not accommodate posts. These shades cover larger areas, but usually with one or two columns or posts which are well out of the way. Canti shades come in a variety of styles and sizes for every playground. Traditional, four-post structures for economical shade solutions. Canopy shades, for example, are easy to set up and offer plenty of shade. The four posts also offer lots of stability, which is ideal for larger shades if you’d like to cover your entire play area. Multi-panel shades. These offer more air ventilation and multiple colors. They can cover larger or irregularly shaped areas, since multiple panels are involved. Multi-panel shades also look great because they’re not one solid swath of fabric. Polygon, hexagon, octagon and other shapes which don’t require a center post. These can include an awning-type attachment from a roof or fence or, more commonly, multiple posts. Hex-shaped hat shades from Playworld, for example, can fit over entire playground structures for maximum sun protection. These uniquely shaped shades tend to offer maximum sun protection over circular play areas. They can also be combined together to cover uniquely-shaped playgrounds. Shade sails. Playground shade sails solutions have different-sized posts for a more unique look which could work with multi-level playgrounds. Structures with 3-point, 4-point Hypar, and 5-point shade sails allow for a variety of applications. Single-post. For a single center post where multiple columns might not fit, solutions such as the Playworld Hypar Shade are useful and don’t take up too much room. Single-post shades can be as simple as a large, umbrella-like structure or more complex structures with turnbuckles and cabling to offer a larger shaded area. Wrap-around shade structures. Traditionally used for dugouts, these shades can cover longer structures. They’re ideal for coverage over a row of slides, and on the playground, they also work well to cover a line of benches intended for caregivers. Cabana-style shade. These structures have long sides which can offer additional levels of sun protection. They’re ideal for smaller playgrounds and to offer more robust coverage for a specific piece of equipment. They can block out sun coming in from the side as well as from overhead. In addition to these structures, playground equipment itself can provide shade. For example, larger structures such as Metro Station or the Cozy Cocoon from Playworld provide spaces under or inside the structure for shade. Cozy spaces for children can provide some protection from the sun while also giving children the option of playing in full sun on top of the structure. Consider the perimeter, playground and areas for caretakers. Don’t just shade one area of the playground. 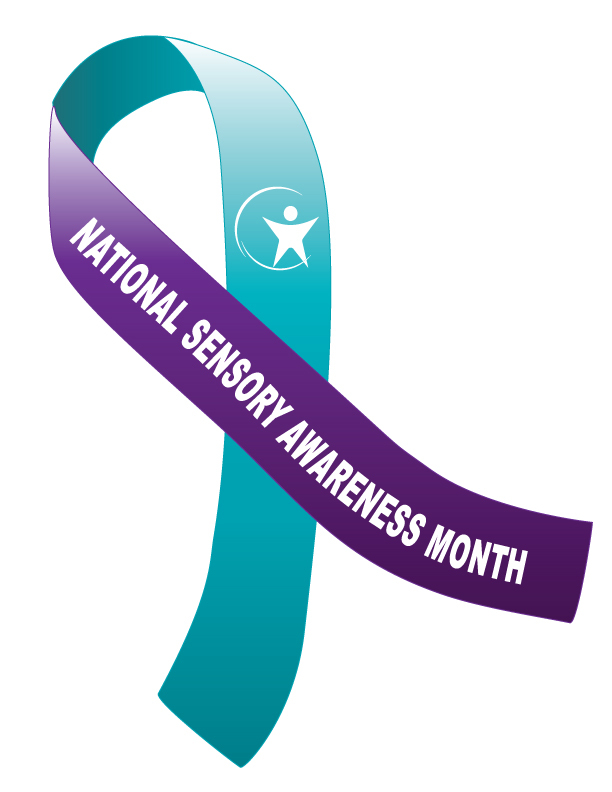 Consider where people will walk, supervise and play on your playground and ensure caregivers as well as children are protected. Ensure the most-often used pieces of equipment are well-shaded. Consider the pieces of playground equipment that have the “cool” factor. For inclusive playgrounds to provide maximum protection, make sure these pieces are especially well shaded. It ensures children with photosensitivity can play on the coolest pieces of equipment and since children in general will be spending the most time on the pieces of equipment with that “cool” factor, you want to ensure they spend the majority of their time in the shade.Leaving the most in-demand pieces of equipment in the hot sun can increase the risk of contact burns and sunburns. Consider playground equipment material. If some pieces of equipment on your playground become hot to the touch, make sure these are well-shaded to protect against contact burns. Older pieces of equipment made from metal, for example, need to be well-shaded. Offer some smaller, sunnier areas for play. This will allow children to move between brighter-lit areas and shaded areas. This ensures children get some vitamin D and some sun exposure while still having access to shade. Determine the average UV levels for your area at different times of the year. This will help you determine how much UV protection you will need. Your local weather station or mobile weather apps will provide UV levels so you can plan accordingly. In some parts of the country, UV levels in the summer can reach such highs that you may decide to cover the entire playground area with shade to offer maximum protection. Look at the playground at different times to determine where the sun is brightest. The sun’s rays will move across the playground as the sun rises and sets. Make sure that any shading you choose covers a large portion of the playground during the times when children will be actively playing. This is important to reduce sun exposure and any potential contact burns from playground surfaces that may become too warm to be safely used. Consider wrap-around shade sources. This will protect children when the sun is rising or setting, and not just when it’s directly overhead. Consider ventilation to ensure air keeps moving to cool down children at play. Any fabric or structure you choose should have plenty of ventilation and should allow for the easy flow of air, ensuring children stay cool and preventing hot pockets of air. Think about durability. You need to ensure the shade material can stand up to weather conditions in your area. Weather-resistant fabrics, such as the Weather Protector series from USA Shade, are coated with Teflon or other materials to ensure many years of weather-resistant use. Think about color and design. Choose a look to complement the look of your playground. Bright colors or fun shapes can work with the playground equipment you have and make your playground look even more attractive. Whether you choose canopy shades in a variety of colors or custom designs in different shapes, shade isn’t just functional. It’s a part of your design and aesthetic. Create layers of shade by building a multi-level playground. This is where some structures (such as play domes) offer an extra layer of sun shade for children who may be especially sensitive to sun. You can also use flag shades with different-sized posts to offer additional shade over multi-level play areas. Consider installing thermometers. Position them near the caregiver relaxation area so parents and caregivers can keep an eye on outdoor temperatures. This can help parents decide when they need to bring their children indoors. Have a cool-off station. Offer a water fountain and a heavily shaded area. This can help children who have over-exerted themselves to relax and avoid heat exhaustion. Consider which playground equipment will involve the heaviest exertion. Then, offer more shade in those areas to protect children from heat exhaustion. If your playground includes swings or areas where children are more likely to jump, hop, run or really exert themselves, offer heavy shade in that area as well as easy access to water to ensure children can stay cool. When designing your playground and choosing shade structures, you’ll also want to give some thought to the material of your shade structure uses. Look for materials with a high ultraviolet protection factor (UPF) to offer maximum protection. Read about the amount of UV protection each material offers, especially if your play area is located in an area of the country with high UV levels. Playworld has the highly flexible Hypar Shade, a 14′ freestanding option with one-piece fabric to cover maximum square footage. The Hypar Shade blocks 94% of harmful UV rays thanks to the high density, polyethylene fabric, known as Colourshade®, which is infused with UV inhibitors. Colourshade® also comes in flame-retardant options for greater protection. USA Shade, a partner of Playworld, offers Shadesure®, Extreme 32™, Commercial 95™, SaFRshade™, Monotec 370™, PVC and PTFE fabrics for you to choose from. Shadesure® is one of the more popular options. This UV-stabilized, high-density polyethylene (HDPE) provides 96% UV protection as well as weather protection. Extreme 32™ is a heavy-duty 320 GSM commercial shade material engineered to be durable and to offer sun protection. Commercial 95™ is an architectural UV-stabilized HDPE shadecloth that’s 100% lead- and phthalate-free. SaFRshade™ is an architectural shade fabric which is flame-retardant and California fire marshal-approved. Completely lead- and phthalate-free, it is recyclable and blocks up to 95% of UV rays. It comes with a 10-year warranty from the manufacturer. Monotec 370™ is made completely from round monofilament HDPE yarns. With a 15-year manufacturer warranty, this shadecloth blocks UV rays and is designed not to stretch over time. Choosing fabric for your shade can be a challenge. Partly, your decision will be informed by the type of structure you choose. If you opt for a custom design, for example, you may want a non-warping and anti-stretching material that will maintain structural integrity. If your playground is located in an area with a harsher climate, a strong manufacturer’s warranty and durability may be important factors to consider. Playworld and our partners can help you explore different fabric options if you have questions. Consider whether you’re adding shade to an existing playground or designing a playground with shade features built in. If you’re adding shade to an existing playground, flexible structures such as multi-panel or single-post structures may be easier to set up. You can simply set them up over existing equipment. Just consider the surfacing material you have and what installation will look likeYou may need to reconsider if your surfacing material doesn’t allow you to install posts easily. 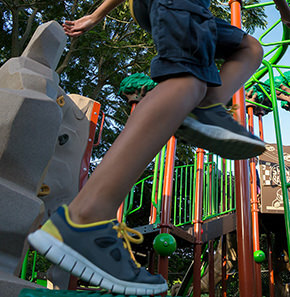 If you’re designing a playground from scratch, you may have more flexibility. You may wish to consider which areas require more shade and which ones can have a little bit of sun. You can also consider how natural features, such as trees, can be used to help create a sun-safe playground.If you’re designing a new play area, you may also have more flexibility with shade structures since you’ll be installing surfacing after you install your shade. Take measurements and consider the type of design you want. Take a look at how much coverage you need in order to cover a significant portion of the playground area. You may want a butterfly-shaped canopy over your playground, but if you need a very large canopy, this may not be feasible. Balance aesthetic wishes with practicality.Also, plan for more shade than you think you need. Keep in mind that the shifting sun will be able to peek through if you create a shaded area that just barely covers the playground. For added insurance, you’ll want to cast a larger shaded area over your playground to offer maximum sun protection. Take a look at sun shade solutions on other playgrounds to get inspired. Some play areas use a creative combination of sun-safe solutions. Be sure to visit Playworld for ideas and options, too. Go beyond shade by posting information on the playground about sun safety. Shade alone may not be enough to prevent sunburns and heat exhaustion. Encourage sun safety on your playground, even if you’ve designed the play area with some safety in mind, by posting safety rules and sun safety rules on the playground itself. Set a budget to determine how much money you need. 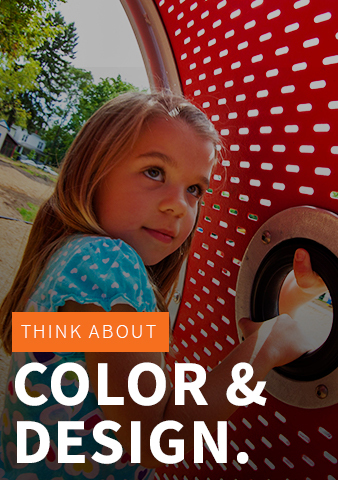 Determine which shade solutions are right for your playground. Consider installation costs and maintenance costs, as well as product costs when determining your budget. Work with cancer societies, pediatricians and other groups to raise awareness about sun dangers. You may have an easier time convincing community members and parents to donate for shade solutions in the playground if they understand what’s at stake. 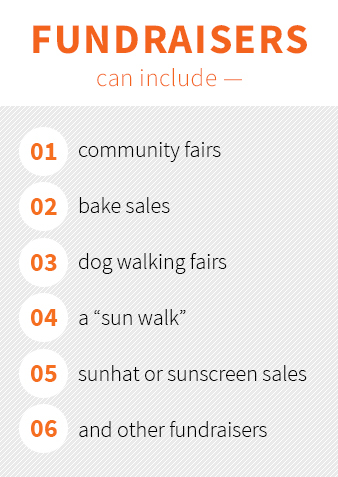 Becoming involved with organizations promoting sun safety can also help you find sources of funding. Write letters to legislators and grant-giving foundations to raise funds. Playworld has a resource for securing funding, and USA Shade has a list of private and government grants available to help you get started. Talk to Playworld about financing options. Contact Playworld for a quote and information about possible discounts and financing. Establish fundraisers to raise money and awareness about the sun. Fundraisers can include community fairs, bake sales, dog walking fairs, a “sun walk,” sunhat or sunscreen sales and other fundraisers. Getting the community involved can mean raising awareness about the importance of sun protection while also raising the money needed for shades. Set up a volunteer group to send letters requesting donations and grant applications. Applying for grants, seeking donations and exploring all sources of funding can be a full-time job. You may need someone to set up fundraisers such as community fairs, someone to apply for grants and someone to research and apply for other forms of funding. Set up a volunteer committee of people who can research and explore all possible funding sources so nothing gets missed. Working together allows you to cover more ground and apply for more sources of financing. You’ll also be more efficient if you work as a team. You can assign tasks based on strengths and can help each other proofread grant applications and letters. Contact local companies to offer advertising space in exchange for funding. If you’re willing to place advertisements on your playground, this can be an easy way to raise funds for shade or even new pieces of playground equipment. Are You Ready for a Sun-Safe Playground? If you are ready to help children enjoy the outdoors without sun exposure or contact burn risk, a Playworld Play Expert can help you find the solution that you need. In addition to Playworld’s Hypar Shade, our parent company, Playworld, offers a range of shade solutions, including the Shade Canopy, the Hypar Shade, the hat shade, modular shades and more. 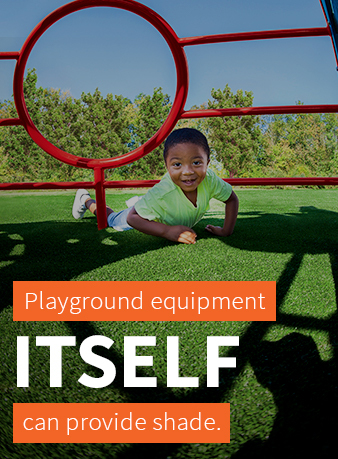 Contact Playworld today to talk to a Play Expert, who can make sure your playground design includes everything you need. You’ll get some great ideas for ways to create a safer environment while still designing a fun and attractive playground. When you’re ready to order, you can get the support you need at Playworld so you end up with a play area that is both safe and exciting!